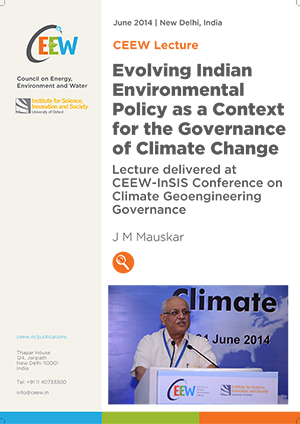 J M Mauskar delivered a lecture ‘Evolving Indian Environmental Policy as a Context for the Governance of Climate Change’ at the Conference on Climate Geoengineering Governance organised by the Council on Energy, Environment and Water (CEEW) and Institute for Science, Innovation and Society (InSIS), University of Oxford on 23-24 June 2014 in New Delhi. In 1950, when the Indian Constitution was adopted, Sustainable Development, was an uncommon phrase. However, there was a directive principle that stated that material resources had to be distributed for the common good. This embodies the concept of sustainable development. India had the Water Prevention & Control of Pollution Act in 1974 and a similar act for air in 1981. IN 1984, the Bhopal Gas tragedy occurred and neither of these acts could have prevented it. So, the Environmental Protection Act (EPA) was promulgated in 1986, marking a shift in approach from controlling pollution to protecting the environment. The fourth assessment report from Intergovernmental Panel on Climate Change (IPCC) was a landmark in climate affairs. India, for the first time, framed its National Action Plan on Climate Change (NAPCC), having several missions under it including Solar Mission, the Energy Efficiency Mission, the Habitat Mission, the Water Mission etc. Steps towards implementation of state climate action plans has seen some resistance. At the state level, there is focus on adaptation strategies as it is driven by local needs and is implemented locally. While mitigation and energy policies are national priorities and implementation happens at the state government level. Between adaptation and mitigation, adaptation is our first priority, but in the future, more money and resources will have to be devoted towards mitigation as the uncertainties about climate change impacts reduce. There is another fear that Solar Radiation Management (SRM) should not undercut the efforts of the UNFCCC. Geoengineering regimes should not be applied through principles different from those in the convention viz. CBDR and equity. Geoengineering is sought to be applied under different principles and although the Oxford Principles are sound, the point they make about governance coming before deployment is important. The conference aimed to examine the governance arrangements that may be needed to ensure that experimentation or deployment of any of the large range of geoengineering techniques being proposed are safe, fair, effective and economic.